Having a water feature in your garden is not only eye-catching but also attractive to wildlife. The sound of running water also creates the perfect calm and tranquil atmosphere for you to relax in. Check out these top ideas for spring. The birdbath is the classic water feature for a garden. As well as providing a perfect decorative touch it will encourage wildlife into your space. If you are not keen on the traditional style of birdbath then check out some more modern designs. Try this hanging birdbath, for £10. If you want something a bit different from your water feature, choose a spherical fountain such as this polished chrome one, for £255. It will add a modern edge to your patio or you could even nestle it amongst the flowers. Falling water is incredibly relaxing and as well as being a sensory feature in your garden. Why not design your own using reclaimed railway sleepers? You can use them to divide sections in the garden and in the case of water the shallow centre creates a great carrier that allows water to cascade off the side. 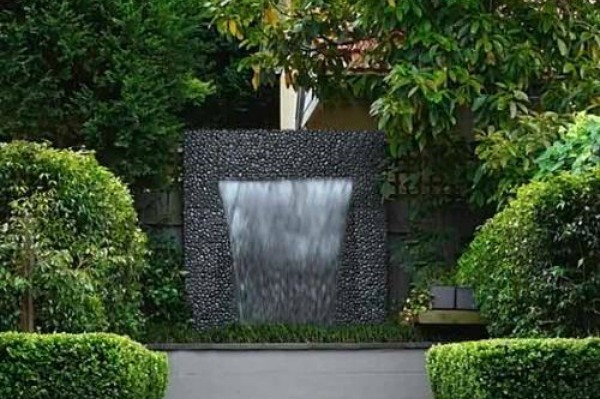 A blade waterfall is perfect for a modern and minimal garden or if you do not have much space in your garden. The blade style is available in many lengths and sizes and is perfect for a slick and attractive focal point for your garden. Try this blade waterfall, for £209. A new, contemporary feature for the garden is the tripe tubes water feature. This consists of three stainless steel tubes of different heights grouped together as a water fountain. As well as an unusual design, the feature is also lit from below, illuminating the fountain for a dramatic finish. Try this triple tube water feature, for £255.